Up first we have Basic Witch is a linear black holo base with lots of silver holographic flakes. The holo finish is strong with this one! It had a perfect formula in just 2 coats, and removal was a breeze. Oh man, you know I love a good orange polish! Boo Felicia is a medium pumpkin orange base with silver and gold holographic flakes and a linear holo finish. Basically there's a bunch of holo goodness in there! You could probably get away with 2 coats, but I used 3 because of macro photos and bright lights. It dried with a smooth finish, and pretty much applied itself. And last, but not least we have Here For the Boos which is a glitter bomb. 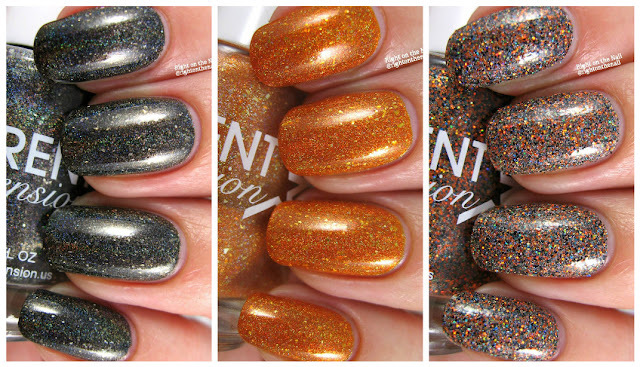 It has black, orange, and silver holographic microglitter in a clear holographic shimmer base. If you want sparkle, then this one is for you. It fully covers the nail in 3 coats, but if you don't like a little texture to the nail, you'll need 2 coats of thicker top coat to smooth it all out. Different Dimension really knows how to make the perfect microglitter polish. Don't forget your peel-off basecoat or the foil for easier removal. You can purchase the set for $30 and it includes a 2 mL cuticle oil with brush in a Candy Corn scent. If you're not feeling all of them, then you can purchase them individually for $12 each (so yeah, you might as well buy all of them with the savings...you can always destash any you don't want). But really, you should just get them all. If you don't want to miss out on anything Different Dimension, make sure to follow them on their website, Facebook, or Instagram pages. Cheers!